Picture - Mozhayskiy post stamp from the USSR. Alexander Fedorovich Mozhayskiy (March 21 [O.S. March 9] 1825 in Rochensalm, current Kotka, Finland - 1 April [O.S. 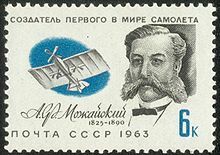 March 20] 1890 in Saint Petersburg), was a Russian naval officer, aviation pioneer, researcher and designer of heavier-than-air craft. Mozhayskiy was developing concepts for heavier-than-air flight. In 1884, Mozhayskiy's monoplane design made a failed attempt at a take-off. His feat is generally distinguished from that of the Wright brothers on the basis that his design appears to have relied upon a ramp rather than wings to generate lift. This conclusion is supported by the fact that Mozhayskiy's wing design lacked the curvature necessary to generate lift. While it is possible that Mozhayskiy's wings slowed down his monoplane's descent, they were unlikely to have ever provided upward movement unless used at angles of attack that would have been unsustainable given the engines available to Mozhayskiy. He also experimented with different angles of attack. Although Soviet propagandists later overemphasised Mozhayskiy's role in aviation by claiming his hop as the first powered flight, Mozhayskiy's achievements in aviation, particularly with regard to flight control and propulsion, were considerable given the limits of the technology available to him and have only recently received serious attention. Probably, Mozhaysky's vehicle was the first one to have all key components of a modern airplane: fuselage, wing, propulsion, empenage and chassis. Cl�ment Ader, a French inventor who designed a series of early steam-powered aircraft.